Download PowerArchiver 2017 2019 setup installer 64 bit and 32 bit latest version free for windows 10, Windows 7 and Windows 8.1. Professional ZIP/ZIPX RAR, ISO, 7-zip compression utility. Exclusive .PA format provides best compression on the market! Features include 60+ formats, FIPS 140-2 Encryption, OpenPGP, Cloud Browser, Backup, Burner, FTP, Tools & Full Win10 support. 2017-10-10 (5697). Malware Test (5697): 100% Safe Tested & Virus/Malware Free. With this application you can tag folders and files, create tags with various shapes and colours, have possibility to do very precise searches , it has preview of multimedia and epub files both in explorer and searcher, no installation needed. PowerArchiver is a professional 64-bit (and 32-bit) compression utility, with support for over 60 formats and exclusive Advanced Codec Pack – .PA format with strongest/fastest compression. PowerArchiver 64-bit version is optimized for maximum speed and performance, and will fully utilize your memory and CPU, by using all available cores. New .PA format has two modes – Optimized Strong and Optimized Fast. It offers best compression on the market due to specialized compressors for pdf/docx/jpeg/mp3/exe/text/image/sound formats. Overall .pa format is strongest/fastest format on the market today! Over 15 various codecs and filters work together to lower the size of your files. Exclusive PDF/DOCX/ZIP re-compression – up to 85% lower size. Special data de-duplication filter will significantly compress similar files. PA is really simple to use, it automatically selects best mode for each file. Machine learning is used to optimize codecs for best speed/compression ratio. Superior multicore, unlimited size ZIP and ZIPX format support compared to other archivers. Fully compatible with WinZip and SecureZip. Support for PA, ZIP, RAR, ZIPX, 7-ZIP, CAB, PGP, TAR, XZ, GZIP, BZIP2, ISO (ISO9660 and UDF), ZPAQ, WIM, BH, LHA (LZH), XXE, UUE, yENC, MIME (Base 64), ARJ, ARC, ACE, MSI, NSIS, CHM, over 60 total. PowerArchiver 256bit AES encryption is FIPS 140-2 validated for government use. Password Policies allow setup of a minimum password policy/rule. File Wiping wipes your temporary files by using DoD 5220.22-M suggested methods. Password Profiles let you easily use complicated passwords. PowerArchiver has advanced GUI with beautiful skins, ability to chose many options. It fully supports 4K displays and large DPI. Touchscreen support! 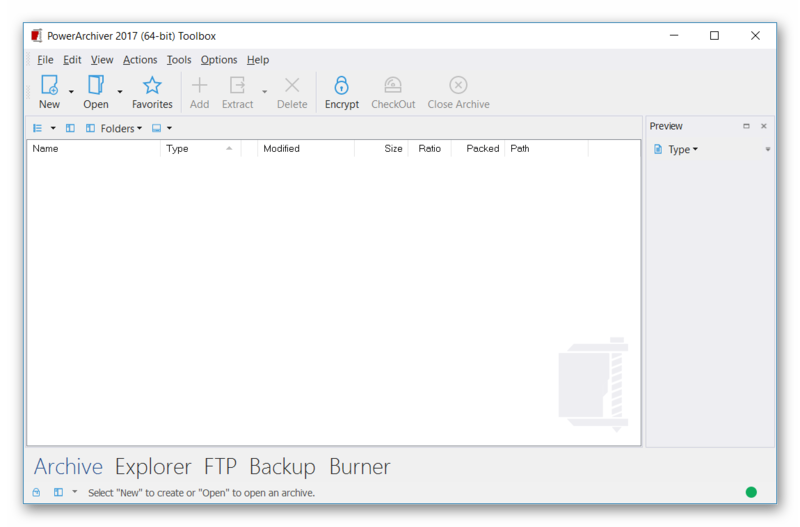 Other features include Encryption with OpenPGP, Backup, Burner, Secure FTP, Convert, Repair, Batch Extract, Batch ZIP, SFX Tool, Compression Profiles, Preview, & much more. Portable 32-bit and 64-bit versions available! PowerArchiver 2017 free to download. PowerArchiver 2017 2019 latest version. PowerArchiver 2017 for Windows 10, 7 and other prevoius windows versions. How to uninstall (remove) PowerArchiver 2017 Completely? Softati.com - does not store PowerArchiver 2017 patchs, serial numbers, activation, cracks, license key, keygen or any forbidden files that may cause harm to the original developer. Only free direct download for the original developer distributable setup files. PowerArchiver 2017 is developed and maintained by Conexware, Inc, Softati.com is not affiliated with this software developers by any means. All trademarks, registered trademarks, product names and company names or logos mentioned herein are the property of their respective owners.